More Than 75 Fun Activities All About Cool Animals! 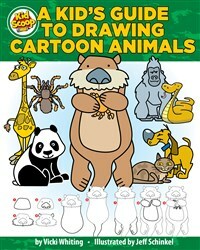 Learn about your favorite animals, and how to draw them, too! New from Kid Scoop, Learn & Draw Amazing Animals combines step-by-step, trace-and-draw activities with fun educational facts for 14 animals, from crocodiles and cats to sea horses and sharks, designed to complement STEM curricula. Vicki Whiting, a former teacher, is founder and president of Kid Scoop, a weekly educational page aimed at children 5 to 10 years old. Syndicated in more than 250 newspapers from California to Bangkok, each Kid Scoop page provides information combined with colorful graphics and interactive games and puzzles. Kid Scoop News is a newspaper currently published in about 10 communities around the United States. Jeff has loved to draw his whole life! As a kid, sometimes he was drawing when he should have been listening to the teacher in class. That’s when he knew he should go to art school, where he would want to hear everything the teachers had to say! Jeff attended the Academy of Art University in San Francisco and now he loves teaching kids how to draw!